. . . another recession now would be unprecedented when you consider the historical evidence. 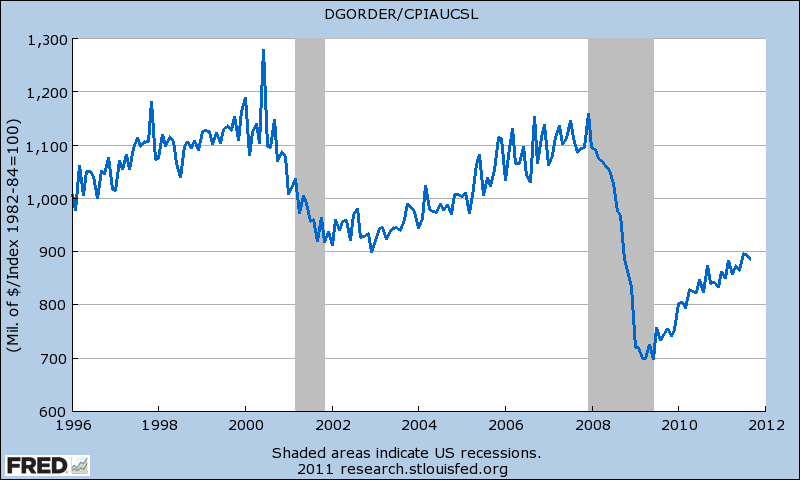 We have never had a recession after the traditional leading economic indicator (LEI) index has been high and rising for five months . . .
Paradoxically, the main justification for the aggressive expansion of the US Money Supply has been to spur lending during a period of market-mandated de-leveraging, which has always struck me as odd. 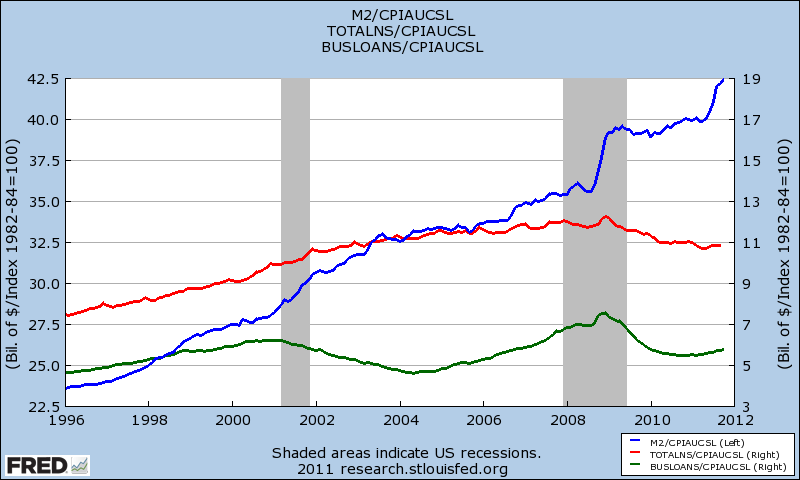 As the graph shows, the Total Consumer Loans series continues trending downward, while the Total Business Loans series has risen slightly in 2011. Overall, however, there has been little positive impact on borrowing, mainly confined to the business side. 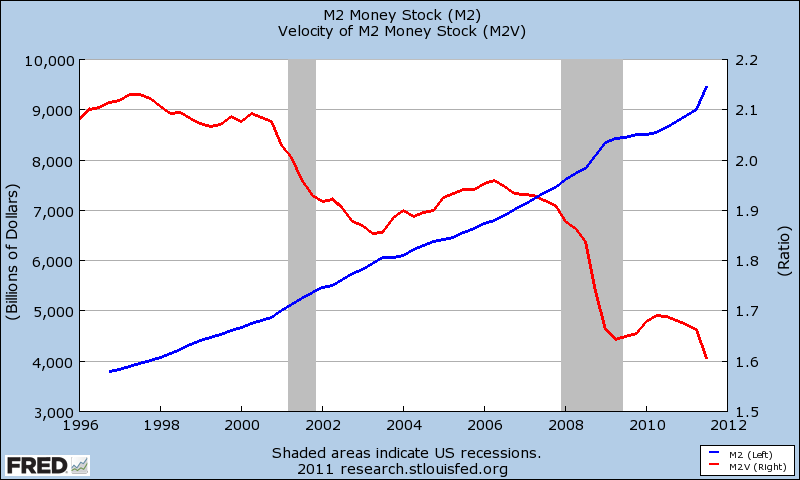 The news from the Velocity series is hardly encouraging — the Velocity of Money has been in a downtrend since 2000, and is lower than it’s been at any time during the last recession. While the most heavily-weighted LEI component has been rising in recent years, this rise is solely due to artificial intervention by the Fed. No positive market response to all this loose money is evident in borrowing or spending. 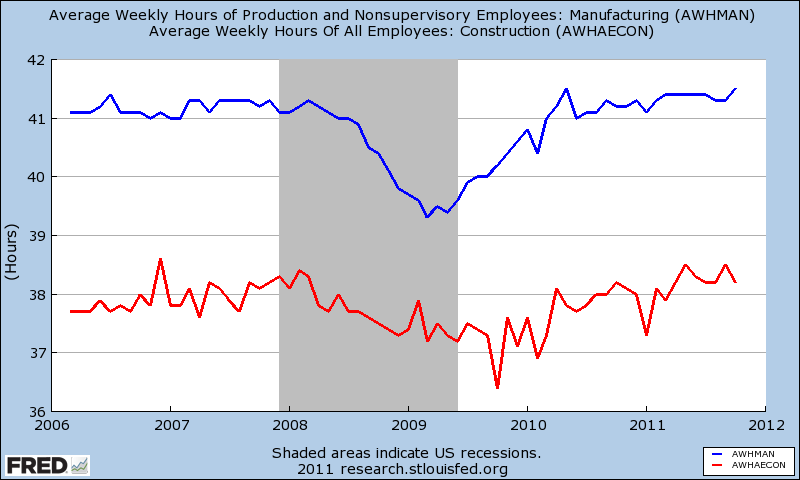 Call me crazy, but I can’t understand how the fact that 3 million fewer manufacturing employees and 2 million fewer construction employees are working the same number of hours forecasts economic growth. Stabilization around a lower level of economic activity would be a more accurate interpretation. Moreover, these 2 variables account for over 60% of the entire LEI. 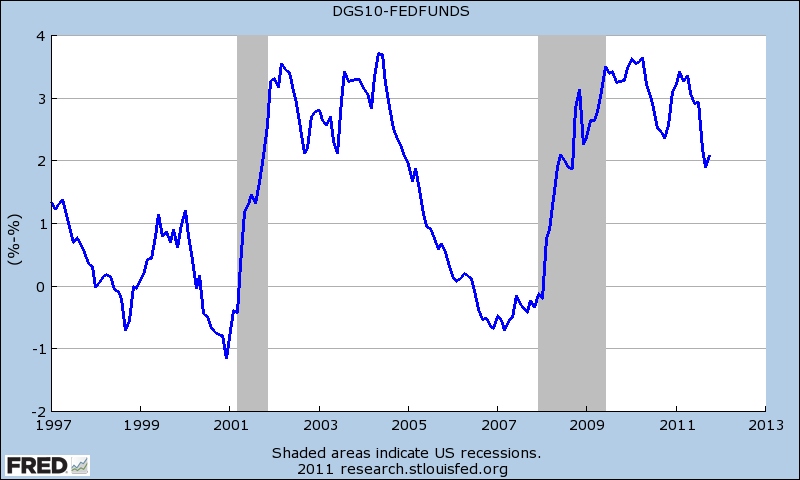 This series is really a proxy for the slope of the yield curve, where an upward-sloping curve implies economic expansion, and a flattening or inverting of the curve implies slowdown or contraction. Two key points here. 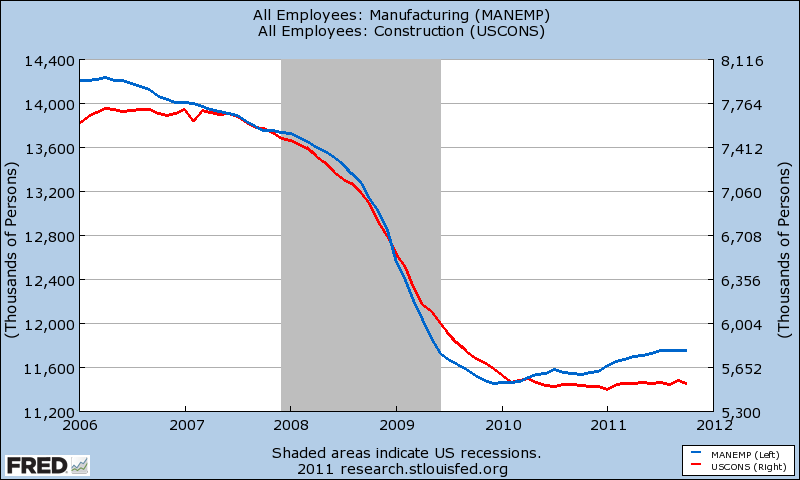 First, the graph shows that the curve has been flattening throughout 2011, accurately foretelling the slowing economy in which we find ourselves. Second, as pointed out in a thoughtful article by Chris Turner via Advisor Perspectives, domestic and global Central Bank intervention has made it impossible to know (or even guess) what market-determined interest rates would or should be anymore. Thus far we’ve accounted for 70% of the magical, mystical LEI index, and on this more granular level, it’s difficult to see the unequivocally positive information that is so apparent to bulls like Ken Fisher. Ah, inflation, that silent thief, working its nefarious black magic over long horizons . . . the series is far less exciting when viewed in real terms. 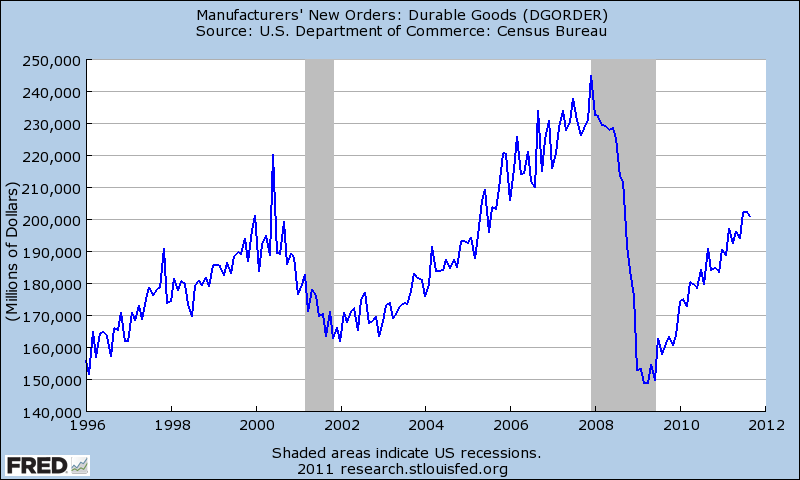 Non-Defense Durable Goods Orders are almost back up to their 2002 post-recessionary lows. With a little luck, we might soon be back where we were . . . 10 years ago. Having accounted for almost 80% of the LEI, I rest my case. Ken Fisher’s exhortations notwithstanding, the LEI appears to be flashing positive signals because, like most averages, it obscures those always-devilish details. The economy has slowed and continues to slow. Unless businesses lay off even more workers to further boost profits, or stock valuations simply continue to ignore fundamental information, stocks may face considerable headwinds in 2012. Ahhh,years and years ,2011-2017 =Bull market. Ahhhh,lik SP at 1192,Nov 2011 now 2399,2400, going 2500 yr end.So much for a Phd and science.